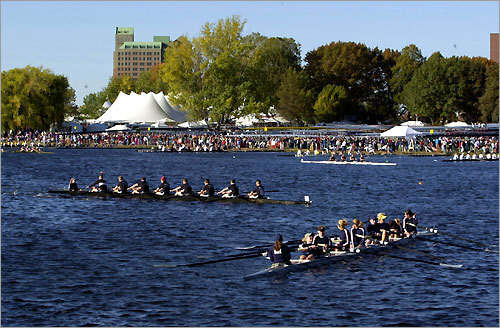 The Head of the Charles River Regatta is celebrating its 47th anniversary this October (10/23 and 10/24). 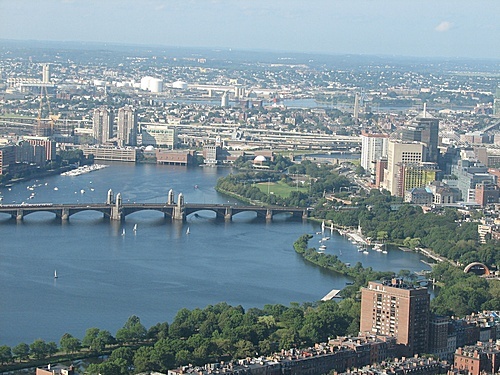 It currently stands as the World’s largest event of its kind and, the 2 day long event during the weekend brings into Boston more than 8,000 athletes and an audience of over 300,000 people, making it a very Busy time for our Boston bed and breakfast. If you are coming to town to cheer on your favorite team or if your traveling plans put you in Boston during this weekend, here are our favorite spots to catch the races. Boston University Bridge – The Boston University bridge is just at the start of the course and the athletes are still fresh off the start line. Here they need a dose of cheers that will last them until finish line almost 3 miles away. Weeks Foot Bridge – The weeks foot bridge is the mid point of this race and its right next to Reunion Village. Reunion Village is a happening spot where athletes and spectators can be comfortable close to concessions and entertainment. Skywalk Observatory at the Top of the Hub in Prudential Center is another great spot to catch the race. If your Head of the Charles experience doesn’t call for dealing with the elements, the observatory allows you to enjoy the race at a safe and comfortable distance. While up there, you can grab a great meal and/or cocktails with a great view at Top of the Hub. If you wish to have more interaction with the regatta, Skullers Jazz Club is our last great sport to catch the races. Skullers has front row seats to the regatta with great food and drinks, and the element of Jazz. Although you cannot see the Head of the Charles from our Boston bed and Breakfast. The roof at Clarendon Square does feature some amazing views of the South End and Back Bay & Downtown Skylines. Our rooftop of our Boston boutique hotel is open year round and has a lovely hot tub which guests enjoy throughout the day and night. For more information about our bed and breakfast or Boston, please visit the other articles in this blog, or the other pages of our website. If you are missing the chance to visit for Head of the Charles, consider a visit in late October or even Novemeber. The crowds will have settled a bit but the weather can still be lovely. This entry was posted in Uncategorized and tagged boston bed and breakfast, boston boutique hotel, boston travel, charles river, head of the charles, regatta, skullers jazz club, skywalk, things to do in Boston by admin. Bookmark the permalink.